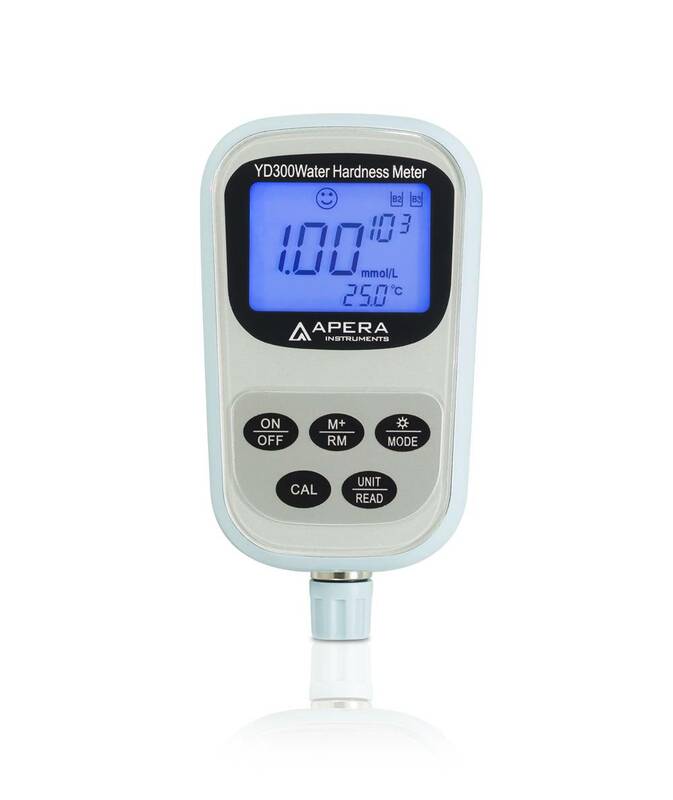 The Apera Instruments’ YD300 is designed for quick & accurate measurements of Water Hardness (the concentration of calcium ions Ca2+ and magnesium ions Mg2+). The YD300 comes equipped with a patented 601 water hardness combination electrode that is proven to produce the same accuracy as the traditional EDTA Volumetric Method but in a much more convenient manner. Unlike the traditional EDTA Method, There is no need for probe stirring or adding reagents during tests, and you can directly measure your sample solutions’ ion concentration just like pH testing. The meter utilizes an intelligent chip design that supports automatic calibration, data storage (up to 99 groups) and a low battery voltage indicator. The YD300 supports the ability to switch between eight commonly used Water Hardness units, including mmol/L, mg/L (CaCO3), mg/L (CaO), mmol/L (Boiler), mg/L (Ca), ˚fH (France Degree), ˚dH (German Degree) and ˚eH (England Degree). The YD300 is IP57 waterproof rated and comes as a complete kit. 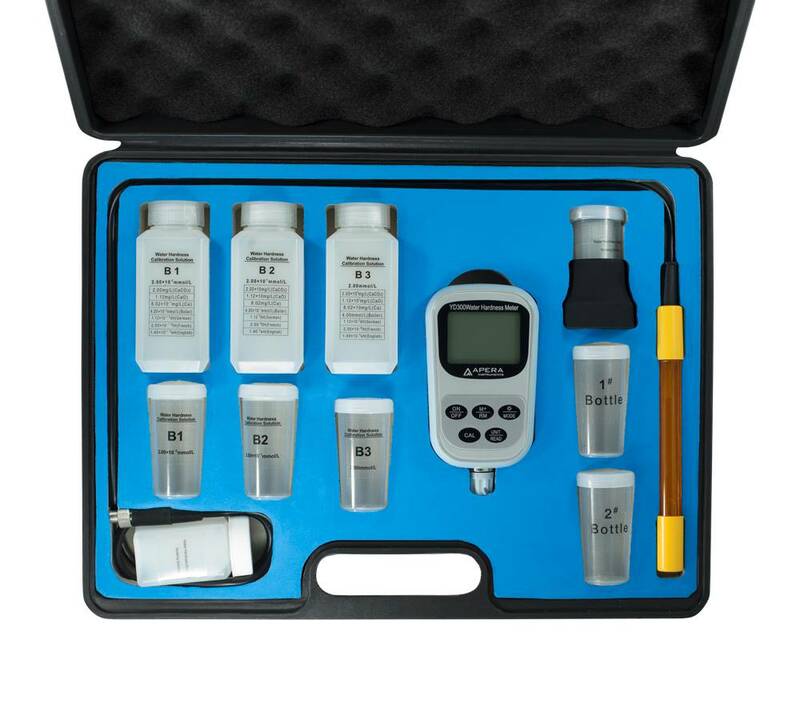 This kit includes the Model 601-S water hardness electrode, Water hardness calibration solutions ( B1, B2 and B3 ); corresponding calibration bottles, Water hardness activation solution, a 20 ml test cup, a test cup pedestal, 2 AA batteries, and a quick manual all in a rugged carrying case. Applications: drinking water, wastewaters, cooling towers, boilers, pipelines, aquaculture, pools & spas. 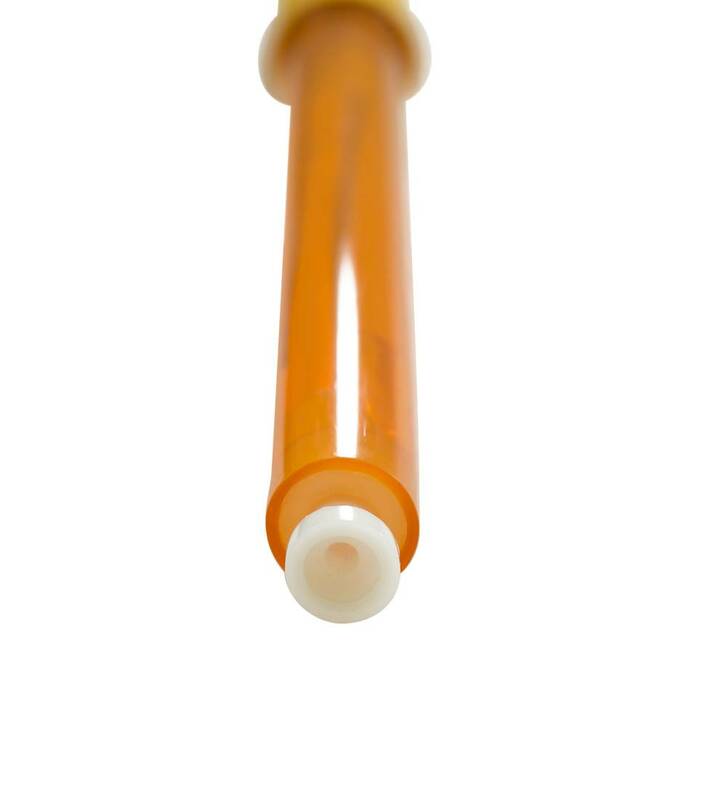 Two-Year manufacturer warranty for the instrument (6-month for the probe). (b) B2/B3 Calibration—using B2 and B3 Calibration Solution，suitable for general water quality.